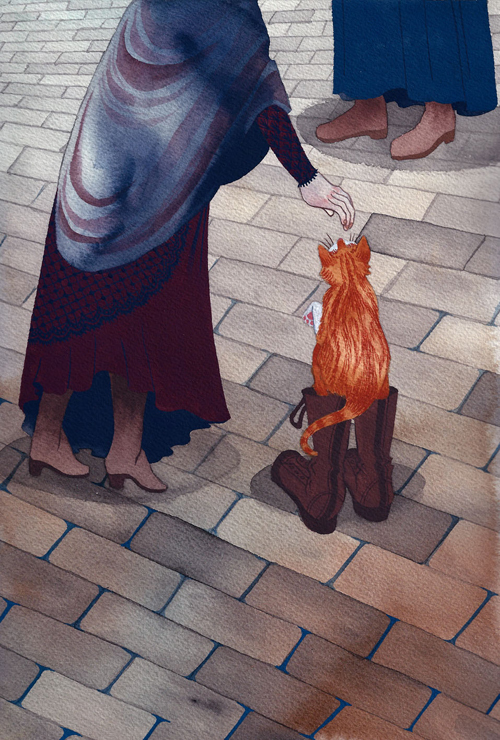 Last night, I submitted my entry to the House of Illustration’s and Folio Society’s book illustration competition. After mistakenly assuming the deadline was a later date (as there are two other competitions with deadlines towards the end of the month), I rushed to paint all four of my entries in four days. Even though I am now a bit tired, I’m glad I pushed through and finished. The competition was to illustrate Angela Carter’s The Bloody Chamber. I happened to have picked up the book a few months ago on a whim. I was quite taken with Jen Munford’s cover illustrations, and decided to give the book a chance, even though highly prosaic short fiction really isn’t my cup of tea. The stories turned out to be wonderfully dark and full of beautiful imagery. So I was excited when I heard about the competition back in October. But I stalled. I was stalked by doubt. The winner of this competition gets their work published by the Folio Society. What chance did I have of winning? People like Sam Weber and Robert Hunt get chosen by the Folio Society, not unknowns like me. Some hotshot like Chris Buzelli or Tomer Hanuka is probably going to sweep in and clean up anyway. Perhaps that’s why I forgot the deadline- maybe it was an act of subconscious self-sabotage. And then I remembered- I’ve entered competitions before and come away empty handed. Hell, that’s the way most competitions go. And even if I don’t win anything, I’ll have a few nice paintings and a few more hours of experience under my belt. I have only three images to share; the fourth, a mock-up of a cover for the book, I would like to keep to myself for now. First, an illustration for the title story, The Bloody Chamber. Second, Puss-in-Boots. This is the only one I would do again, if given the chance. But that’s what happens when you don’t give yourself enough time to do things over; you turn in things you aren’t very proud of. 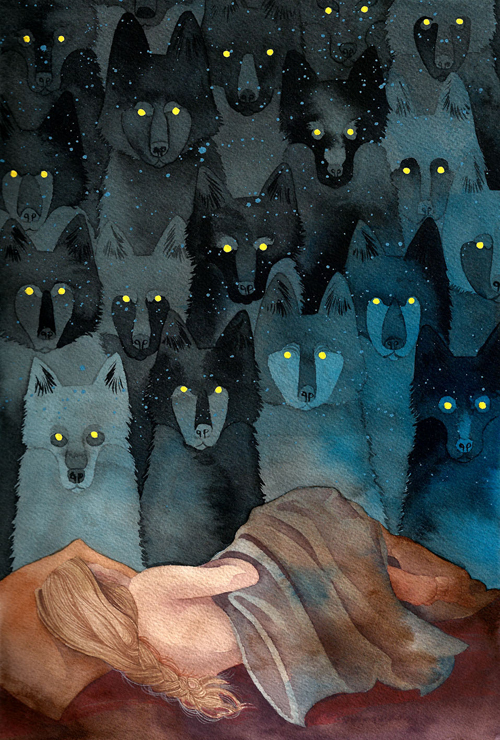 Lastly, In the Company of Wolves. This one is maybe my favorite. So that’s that. I have a week or so to rest until I need to get started on my next piece. I’ll hopefully forget about my doubts, be pleased with my work, and when the time comes, not be too displeased with the eventual “we thank you for your entry, but,” letter. It won’t matter by then; I’ll have already started pieces for another competition. They are all really wonderful, but that last one is amazingggg. You could totally win. Janelle, thank you so so much for the lovely comment. One of my earliest memories of drawing is of me sitting in my dad’s office on take your daughter to work day, drawing a picture of a cow on the moon. So I’m pretty delighted to hear that I’ve had a following since then! Thank you! And Jen Munford’s cover really is beautiful, isn’t it? I’m really glad to have found your blog. Oh, don’t worry, ask away! These paintings were done in sumi ink, acrylic ink, and gouache. So for example the wolves are in sumi ink, there’s a wash of blue acrylic ink over them, with gouache for their eyes and the snow. The girl at the bottom is in gouache, but the colors were a bit bright so I toned them down with a wash of brown acrylic ink. I’m glad to meet you too! Your exercises in ink are wonderful.